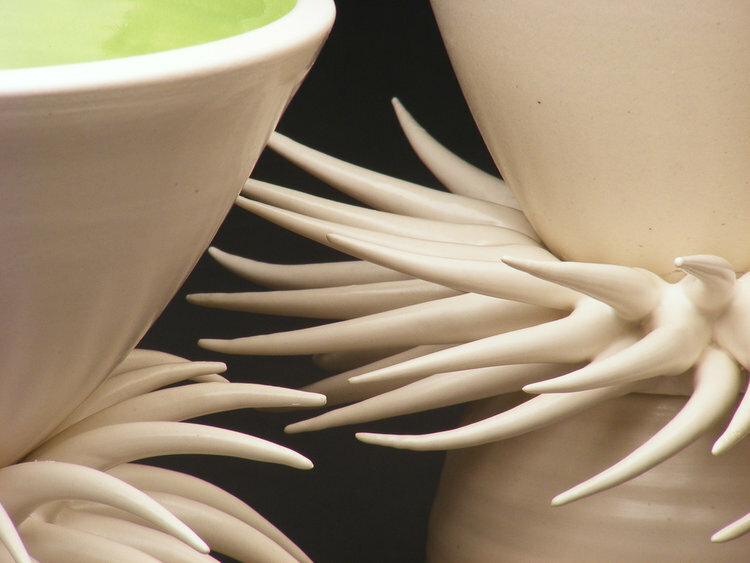 Lisa Lockman lives in Lincoln, Nebraska, where she has taught Ceramics, Metalsmithing, and Non-Western Art History at Nebraska Wesleyan University since 1990. She received a Master of Fine Arts degree from Indiana State University in Terre Haute, Indiana, and a Bachelor of Arts degree from Indiana University in Bloomington, Indiana. Lisa's work has been exhibited both locally and nationally. Most recently, she had a solo exhibition at the Kimmel Harding Nelson Center for the Arts in Nebraska City during the Fall 2017. Her wall installation, "Agatha" will be installed in October 2018 at Spring Hill College in Mobile, Alabama, for the duration of the academic year. For the nearly two decades, I have created sculptural vessels loosely influenced by ancient Chinese bronze forms, specifically, the bronze vessels of the Chinese Shang (1700 - 1000BCE) and Zhou (1045 - 221BCE) dynasties. Several motifs have been adopted from those ancient bronze works, but as a basis for the form, not simply as a decoration applied to the form. Misplaced comes from testimony of my third great grandmother, Mary Ann Bennington, trying to prove her marriage to Stephen O. Lockman after his death so she could receive the widow’s pension owed her. Since she could not produce a wedding certificate, two family members testified on her behalf to having been present at the wedding ceremony. Misplaced is an excerpt from her pension file housed in the National Archives cut from wood with a laser.